Soccer West Soccer Club plays home games at Aiber Field in Des Moines. 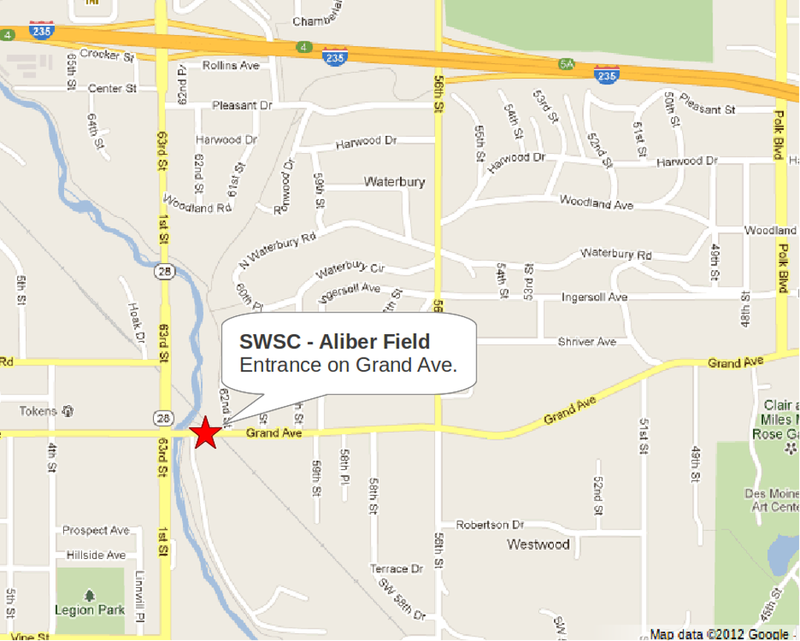 The field is located at 6220 Grand Ave, just East of the intersection of 63rd Street and Grand. Take the 63rd St. exit from I-235 head South to Grand Ave. Turn LEFT (East) onto Grand, then immediately RIGHT into the Aliber/Sands driveway. Take Exit 99 and go North on IA-28, which becomes 63rd Street. Turn RIGHT (East) onto Grand, then immediately RIGHT again into the Aliber/Sands driveway. There is a large parking lot in front of the soccer fields, just past the SWSC/Menace field house, all on the LEFT of the driveway. Overflow parking is allowed on the grass to the RIGHT of the driveway. Additional parking overflow is allowed at Zip Zone but should be used as last option.